We have a great deal to make savings at Giant. 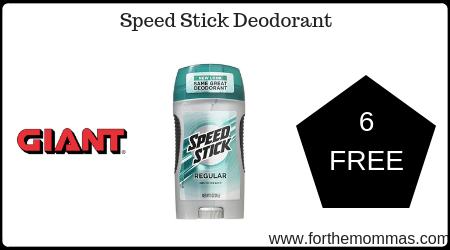 Speed Stick Deodorants are priced at $2.00 each. Plus we have a Speed Stick Deodorant printable coupons to use on this deal that will further reduce the price. In addition to this you will earn $10.00 in gas rewards points that will make the final price FREE + $2.00 moneymaker!